Elizabeth de Montecute (Bess) is not a happy camper when she learns she is to be married to the son of the notorious Hugh le Despenser, lover to King Edward II. The fact that the son is nothing like the father does nothing to assuage her displeasure. Now, Hugh is no more thrilled about the arrangement than Bess, but he’s a realist and when the king offers you an heiress and daughter of his closest advisors, you take it! After the grisly execution of his father, the third Hugh le Despenser was imprisoned for a few years and then granted a release from King Edward III, whom he serves loyally. Hugh made a name for himself as a great fighter and led troops in some of England’s greatest victories, never once deviating from his lifelong mission of bringing back honor to the family name. His efforts are rewarded with the return of family land and the young and beautiful Bess for wife. Hugh & Bess is a story of two people coming to terms with their fate and the journey along the way. One thing that really sets Susan Higginbotham apart as an author for me is her ability to bring her sense of humor to each character. And characters that can poke fun at themselves are my kinda people! If you’ve ever read her blog, you’ll know what I’m talking about. Another thing Susan is also brilliant at is dialogue, which seems to me the hardest part of writing a novel. Hugh & Bess is a great historical fiction novel for pro or amateur and at 320 pages it’s an easy one-sit read! 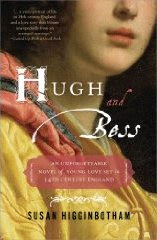 Much thanks to Sourcebooks for sending me Hugh & Bess! I read this when it was first published and really enjoyed it - I wish it had been a little bit longer! Great review! I liked the sense of humour very much as well. This on is on my list for sure. Nice review, I really like that it is short and to the point. I want to read this one I am just getting to Hugh in Plaidy's Follies of the King. I've pre-ordered this one from Amazon so I can't wait to read it. Takes a bit longer to get here to us in Australia but from the sounds of your review it will be worth the wait. This one is on my shelf, and I'll be reading it soon. Can't wait, as I loved The Traitor's Wife. Thanks for the review, Amy! I know I must read this. I also know I must catch up with what I already own too... oh the dilemma. This was just fantastic! It was such a great read. I'll be posting my review tomorrow but I had it finished yesterday already. Once I picked it up I couldn't put it down. Great review! You have really made me want to read this book! Non Now! everyone has good things to say about this one! I like the quote too! thank you for sharing !!!! I read this last Sept and enjoyed it very much! Its sense of humor is definitely palpable, it had me LOL. It was a quick read, but very cute and sweet story of Hugh & Bess. I have to confess that I fell in love with Hugh (shhh--that a secret between us here)!